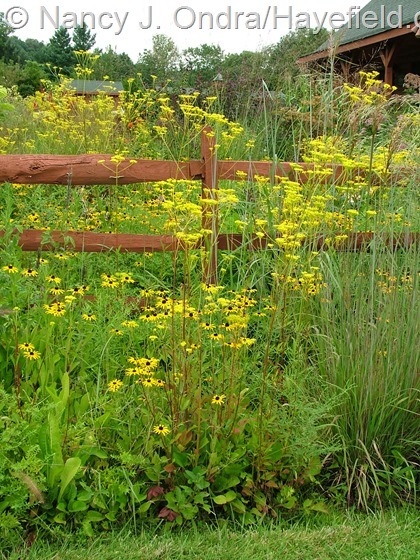 This uncommon perennial goes by a number of common names. 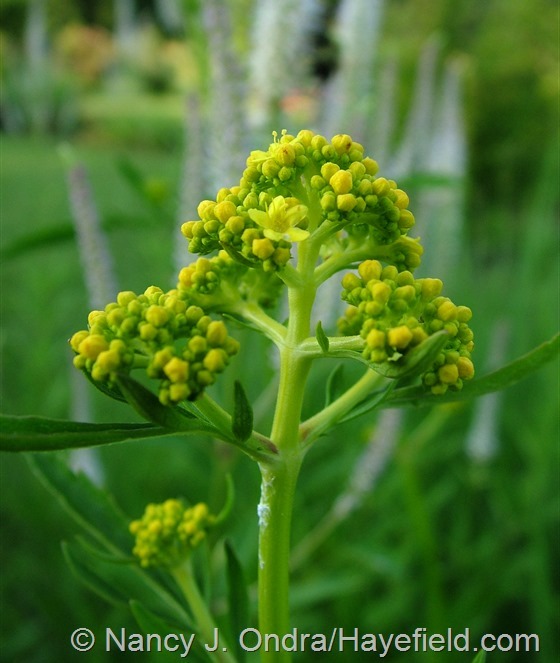 “Patrinia” is an obvious one, and it’s the one I use when I think of the plant, but it’s not very precise, because it’s just one of several rather different-looking species. “Scabious-leaved patrinia” is more appropriate (the leaves do look much like those of a scabiosa, as the epithet indicates), but that definitely doesn’t roll off the tongue. 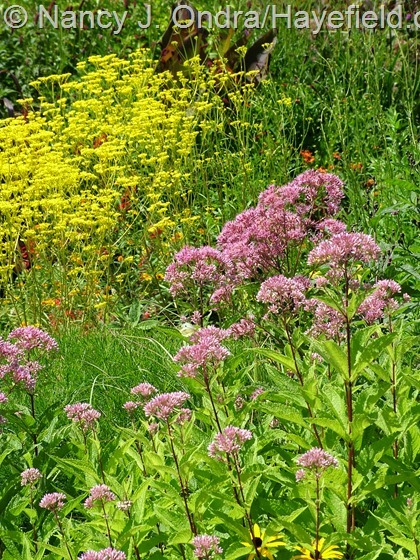 “Yellow-flowered valerian” or “golden valerian” is a somewhat better name: it tells you the color and gives you some idea of the form (if you know what valerian looks like), and it actually is in the valerian family (Valerianaceae). I’ve seen it sold as “camel’s cover” too, but I have no idea who came up with that name, or how. 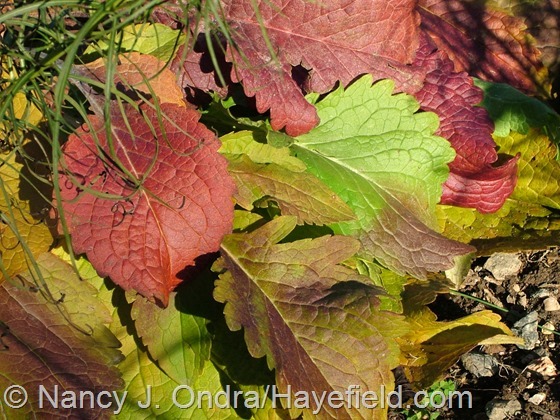 When I write about the plant, I mostly use “golden lace,” because that’s how it was labeled when I bought it; plus, it’s a nice name: not too silly and reasonably descriptive. I imagine that other names will come into use as this plant becomes better known in American gardens. It doesn’t seem to be particularly well known in European gardens, either, though I tracked down a reference to it growing in England as far back as the 1820s (The British Flower Garden, published in 1827). While some sources merely give “eastern Asia” as the origin of this species, others specify Japan and Korea, and it has long had a place in Japanese art and poetry as one of “the seven grasses [flowers] of autumn.” (If you’re interested, you can read more about it and the other six—one of which is the infamous kudzu—at The seven flowers of autumn – Aki-no-nanakusa(秋の七草) and Autumn Tea Flowers. In Japan, it’s known as omina-eshi or omina-esi, which apparently translates into “maiden flower” or “ladyflower.” According to this source—Patrinia scabiosifolia—it is even known as “prostitute flower”! That might be explained by this bit of reference: A Waka Anthology: Grasses of Remembrance. That name sure would get it more attention over here, though maybe not the right kind of attention. 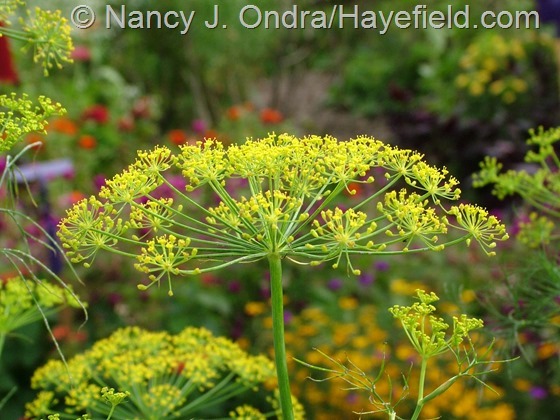 But, well, dill is an annual, doesn’t flower all that long, and declines quickly when it’s done. Parsnips are biennials, so they’re only green the first year and then gone after one season of bloom. 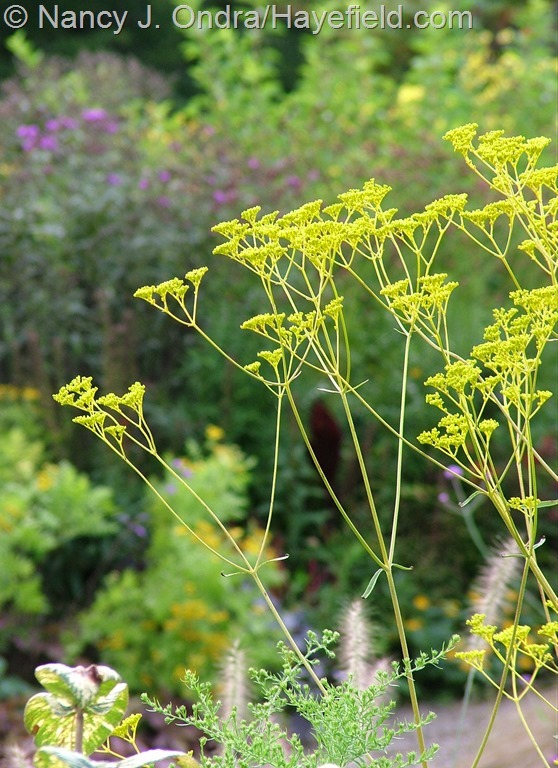 Fennel is perennial, at least, but it’s just not the brilliant lemon yellow of golden lace. There’s lovage (Levisticum officinale), too, but it’s a big, leafy thing that takes up a huge amount of space and then looks sort of ratty after flowering. None of them have the same airy grace, bright color, and late bloom season of golden lace. …and perennial sunflowers (Helianthus), such as ‘Lemon Queen’. 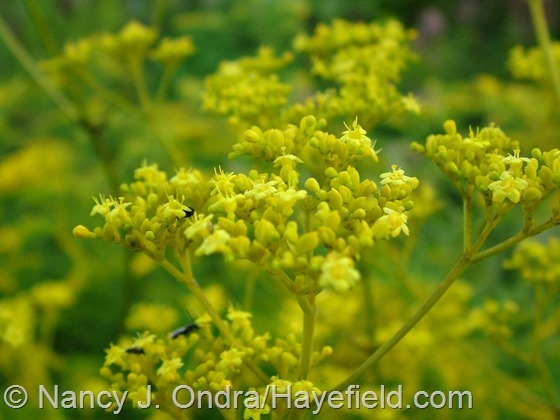 Golden lace, which can grow anywhere from 4 to 7 feet tall, and ‘Fireworks’ goldenrod, at 3 to 5 feet, are roughly in the same height range. 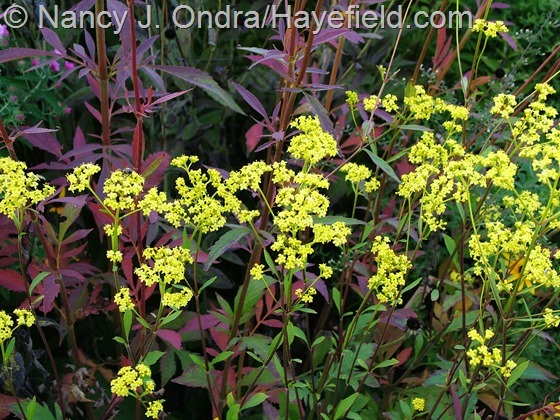 But you know how non-gardeners tend to have fits when they see goldenrod in a garden, no matter how many times you tell them that it isn’t to blame for their fall allergies, so golden lace may be a better choice in a high-visibility spot. And ‘Lemon Queen’ sunflower is plenty tall, easily reaching 6 to 8 feet, but it can easily spread that wide as well, and it tends to flop if you don’t stake it or do some serious summer pruning. 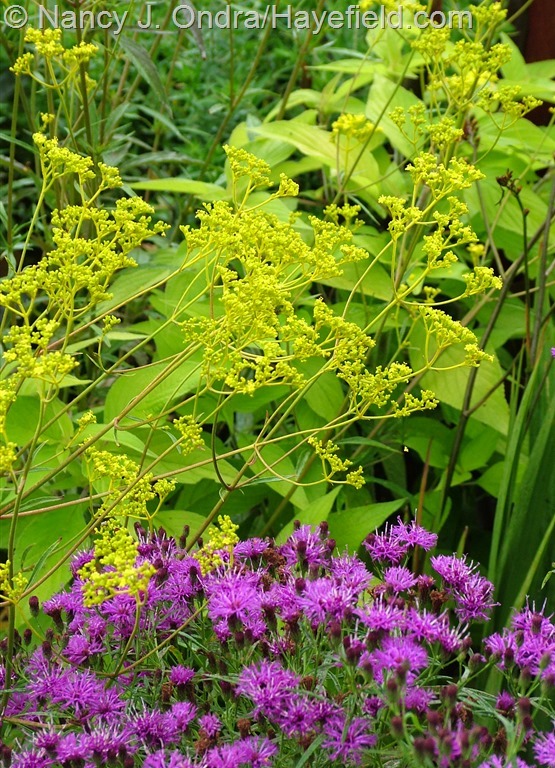 Golden lace offers useful height but with a much smaller footprint—I’d say 12 to 18 inches for a well-established clump—and its sturdy, sparsely leafy stems rarely require any sort of support, especially in full sun. 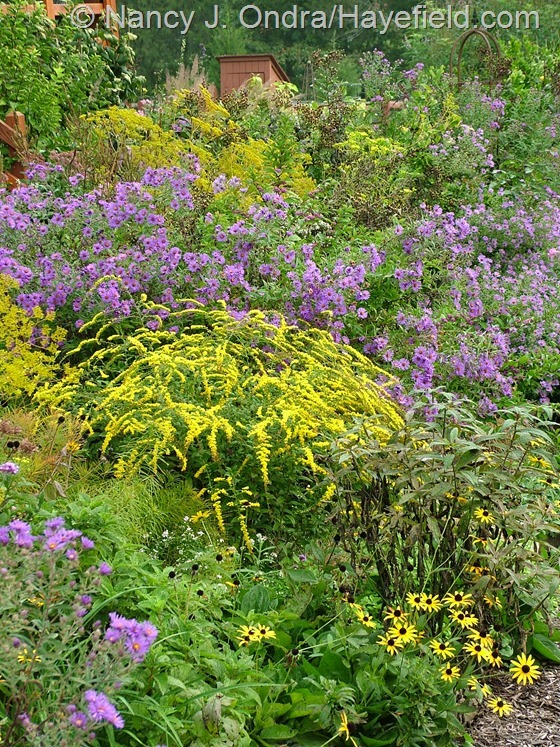 Golden lace has a gratifyingly long bloom period, usually starting some time in July here in southeastern Pennsylvania and continuing to look good well into fall. The way that the bright yellow of the flowers continues down into the stems gives the whole cloud of bloom an extra punch of color. And since it has very little foliage near the tops of the stems, you can easily see other colors through the golden lace flowers. That see-through quality also means that you can plant it (or let it plant itself) right at the front of a border without having it block or smother the plants behind it. 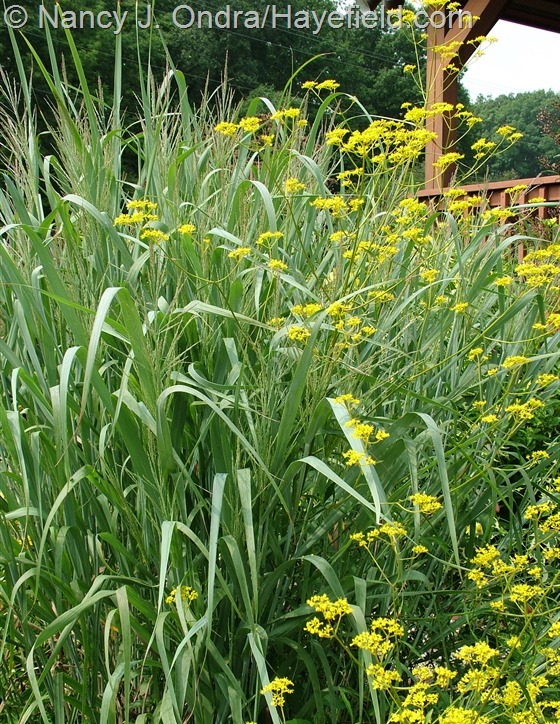 Seed-grown plants can vary quite a bit in height and form. 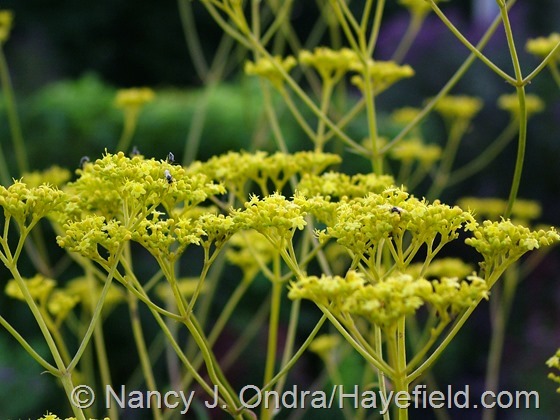 Some are very open and airy-looking, with widely spaced umbels. Others are naturally much denser, though still see-through. 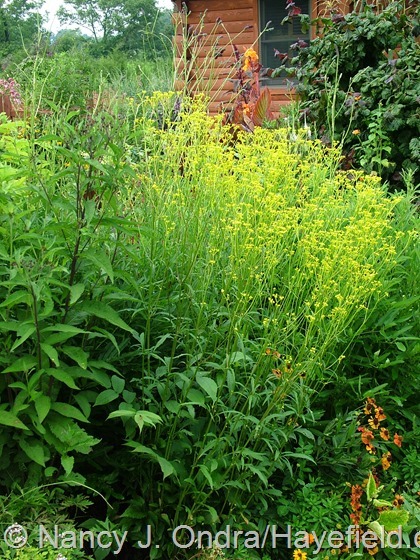 Regardless of what a particular clump wants to do, you can force it to be shorter and bushier by cutting it back by about half in early to midsummer. 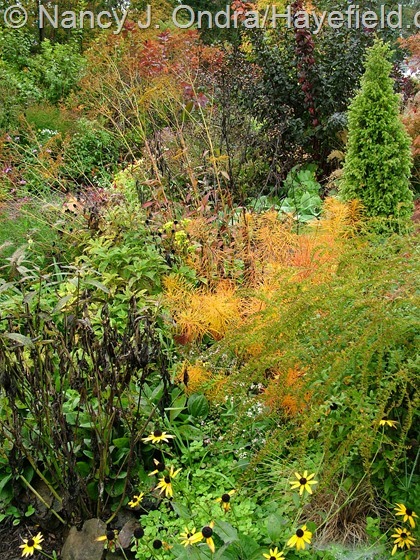 I do that with some of my plants, if I know that I want the color at around 4 feet rather than 5 to 6 (as with the clump below), but I actually prefer it in its looser, unpruned form. 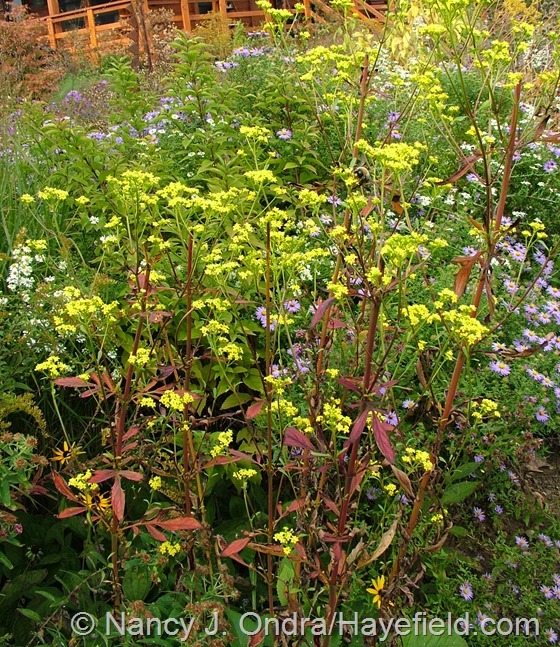 The shot below shows a July-pruned clump in the foreground with some uncut clumps behind, including a particularly tall one toward the back. 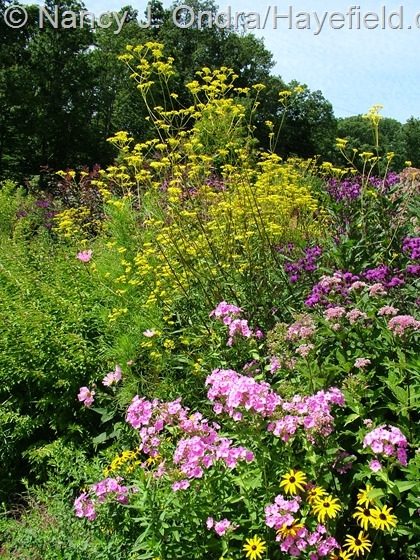 I imagine the variation could be annoying if you prefer your perennials to be more uniform, but I like the meadowy effect so it doesn’t bother me. If golden lace gets more popular, I wouldn’t be surprised to see growers make some selections and propagate them vegetatively for gardeners and designers who want more predictable results. As far as I can tell, there’s currently only one named cultivar here: ‘Nagoya’, which is a more compact 2 to 3 feet tall. According to the 1994 Heronswood catalog, it was selected for cut-flower production in Japan. In regard to the recommended growing conditions, you can find sources that say everything from full sun to full shade. My plants thrive in full sun, and a few have planted themselves in partial shade, but they lean a bit more there. I found a few reports of it growing in even full shade, including this one, but I’ve not grown them there myself, so I can’t give a firsthand account. The advice on soil conditions is equally diverse, ranging from dry to moist, but most settle on average to moist, and that meshes with my experience here. USDA Zone recommendations are usually 4 to 9. 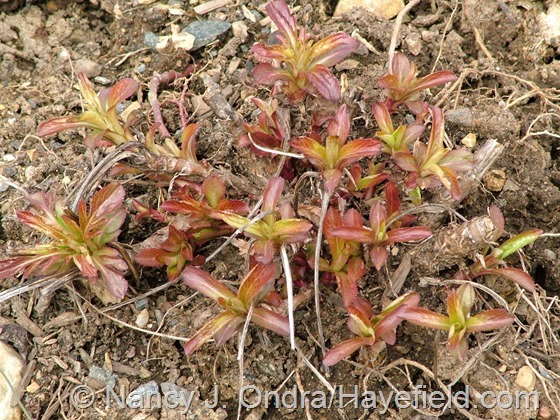 Now, as far as the seasonal interest…well, established clumps of golden lace can have a nice touch of red on the emerging leaves, but even its biggest fans can’t claim that it has significant early-season impact, so I don’t count spring as a season of interest. 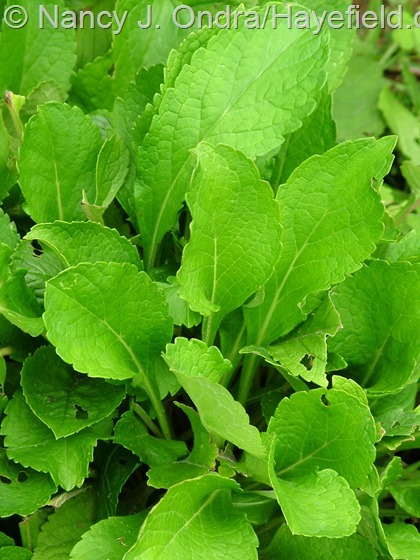 The clumps of basal foliage are a nice bright green but basically undistinguished—in spring and summer, anyway. 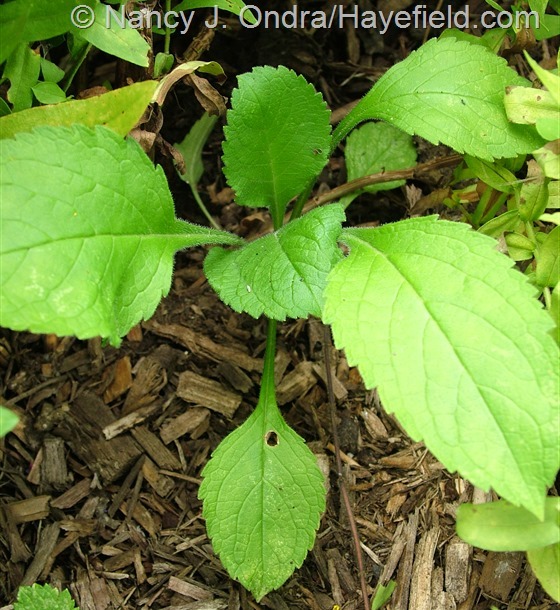 The young leaves tend to be entire and older leaves deeply divided, but they can vary quite a bit. …and comes into full glory around the beginning of August. 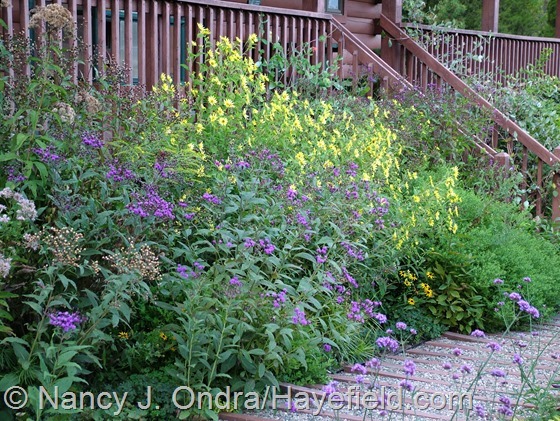 Below, it’s with spike gayfeather (Liatris spicata) and orange and purple coneflowers (Rudbeckia and Echinacea). 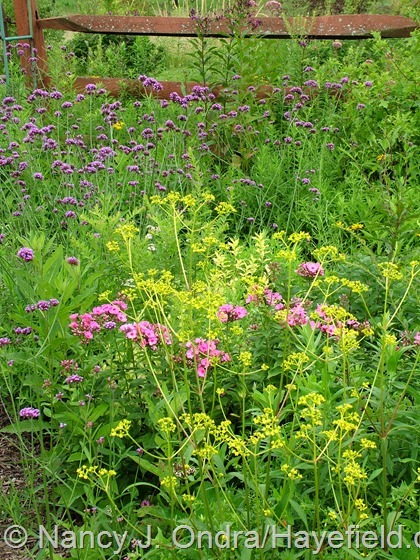 Joe-Pye weeds (Eutrochium) are another option for a late-season pink. I’ve tried it with ‘Erica’ Culver’s root, too, which is a softer pink; it’s okay, but I think it would be prettier if the pink were more intense or the yellow a bit softer. 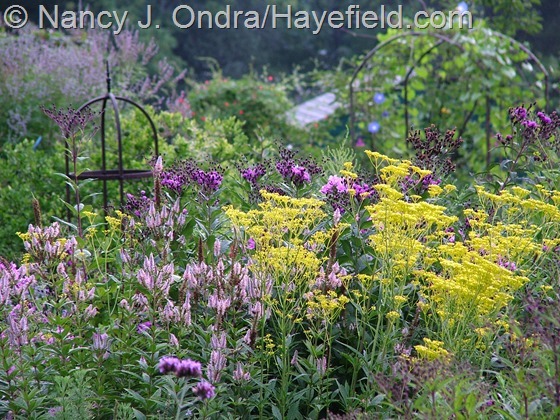 The bright purple of ironweeds (Vernonia), such as New York ironweed (V. noveboracensis) above and V. lettermannii below, is one of my favorite color partners for golden lace. I used to hate clear yellow with golden yellow, but now I don’t mind that so much, especially if they’re separated with some green. Below is golden lace paired with ‘Lemon Queen’ perennial sunflower (Helianthus) and underplanted with orange coneflower (Rudbeckia fulgida var. 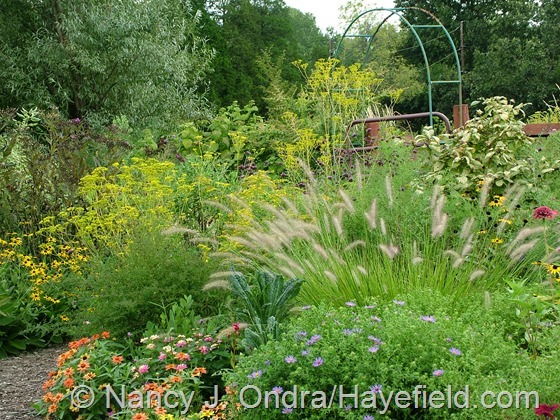 fulgida) and ‘Cassian’ fountain grass (Pennisetum alopecuroides). I normally wouldn’t deliberately pair yellow with silvery gray, either, but it has its moments. 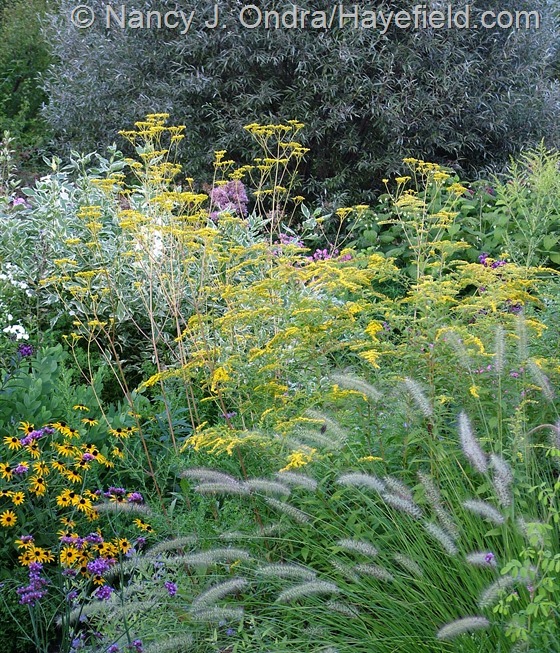 Below is golden lace, orange coneflower, and ‘Fireworks’ goldenrod (Solidago rugosa) in between ‘Cassian’ fountain grass and silver willow (Salix alba var. sericea). 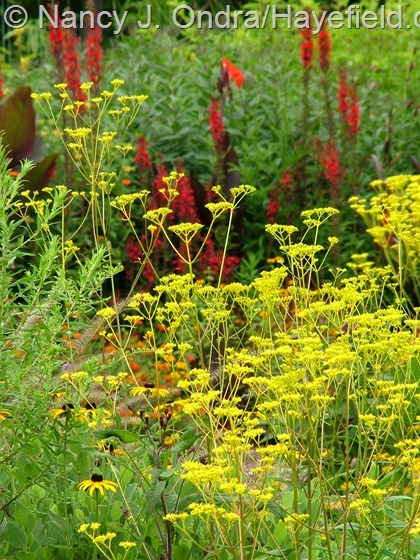 …and bold enough to pair perfectly with hot colors in the late-summer and fall garden. Above it’s with ‘Orange King’ zinnias (and the dark tails of Sanguisorba tenuifolia); below, it’s set against cardinal flower (Lobelia cardinalis). Purples, violets, oranges, reds…they’re all gorgeous with a bit of golden lace! One color pairing I haven’t tried yet is golden lace with a good blue. Unfortunately, the blue monkshood (Aconitum carmichaelii) I have blooms too late, but I’m planning to experiment with a tall, blue-flowered salvia, such as Salvia guaranitica ‘Black and Blue’, next year. 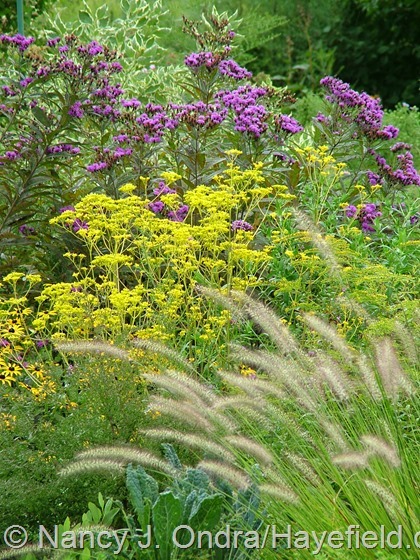 Medium-height to tall grasses make superb late-summer and fall partners for golden lace, too, perfectly complementing its meadowy look. 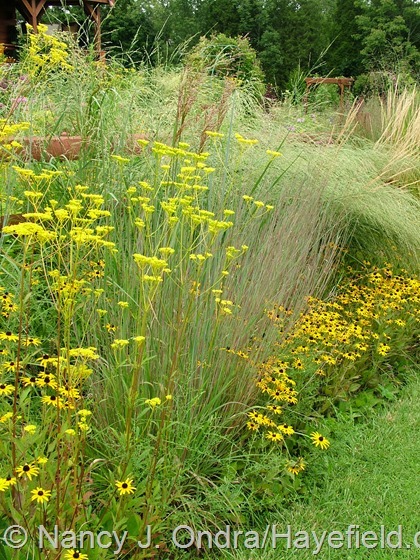 Above is golden lace and orange coneflower with ‘The Blues’ little bluestem (Schizachyrium scoparium); below is golden lace with ‘Dallas Blues’ switch grass (Panicum virgatum). 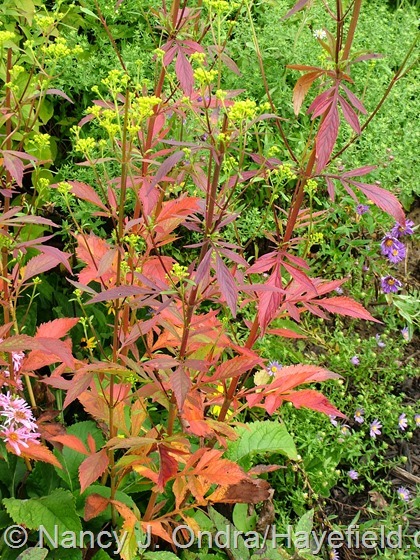 …but it still shows up well, especially against darker plants. One of my favorite things about golden lace is the way it responds to late pruning. Now that I have a number of clumps to play with, I like to cut some of them back by a third to a half in the second or third week of August. That way, I get several weeks of color in late summer and another shot of fresh color in mid-fall. You can see the difference between a pruned and unpruned clump in these two shots: above in early October and below a few weeks later. Whether or not you decide to cut it back, you’ll get to enjoy golden lace’s other fantastic feature: colorful fall foliage, usually in shades of red and orange. 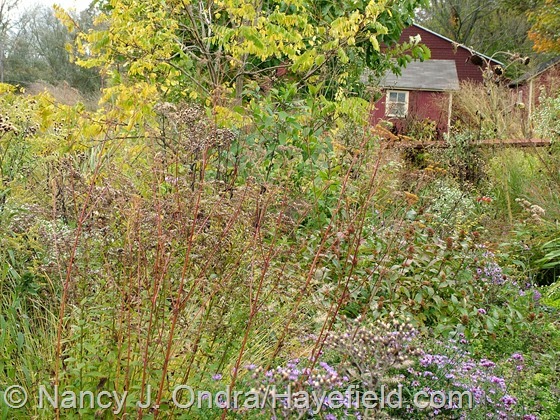 Look how prettily the rebloom of partly-pruned golden lace shows off against the fall-colored leaves in early October. 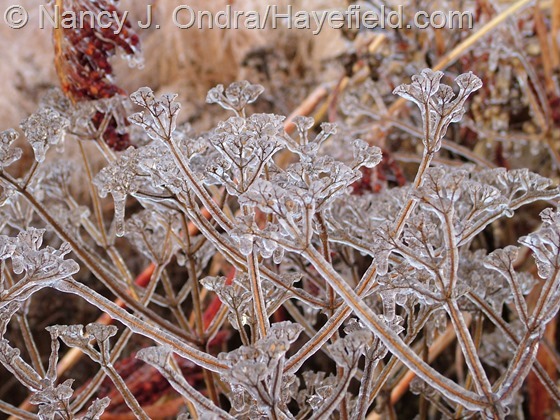 By late October, the flowers have mostly gone to seed, but the plants still have some presence. 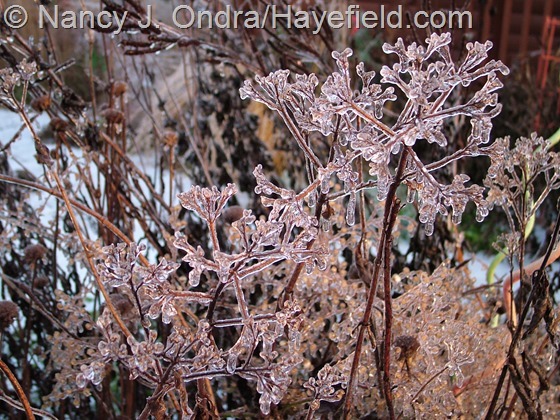 And though the seeds mostly drop in late fall, the skeletons stick around into early or even midwinter to catch a coating of ice or snow, giving golden lace its third season of interest.. Speaking of seed, I find that to be the easiest way to propagate golden lace: I just let the plants self-sow (which they do lightly, not scarily), or else sow the seeds in pots in winter and leave them outside to sprout in spring. According to the Seed Germination Database, another option is to chill the sown seeds for several weeks and then move them to a warm spot to germinate. I’ve read that you can divide established clumps in spring, but I’ve never divided mine; the oldest have been in place for about 10 years and just keep getting better every year, so I don’t see a need to bother them. I find that young plants (those with three to five pairs of leaves, like the seedling above) don’t much mind being moved, but older plants can sulk severely, especially if I try to move them once they start producing new growth. The clusters of tiny flowers are very popular with a variety of insects. I occasionally see a butterfly or two on them, but most of the visitors are various flies, bees, and wasps. 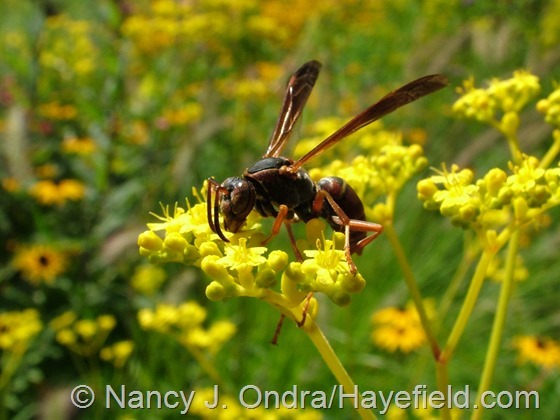 They’re usually so busy gathering pollen and nectar that they don’t get upset by passersby, but if that worries you, you’ll probably want to put your golden lace plants in the middle or back of the border and not right next to a path or doorway. Another reason you might think twice about putting golden lace in a high-traffic area is the scent. Descriptions vary from “fragrance” to “odor,” and from honey to wet dog or dirty socks, giving you a clue that some people like it and some people don’t. Sometimes I notice a slight whiffiness around it, especially on a sunny day, but most of the time I don’t get any smell from it. Apparently the flowers contain a number of volatile compounds, some of which are fruity and some of which are clove-like, so maybe that accounts for the variability. If you’re interested in more details, check out Analysis of Volatiles in the flowers of Patrinia scabiosifolia by HS-SPME-GC-MS. That article also references some of the many medicinal uses of golden lace, which I hadn’t been aware of and found really interesting. For more details on the potential of golden lace as a healing herb, check out Ethnopharmacology of Medicinal Plants: Asia and the Pacific and The Healing Power of Chinese Herbs and Medicinal Recipes. Golden lace has another use too, as a cut flower. I find it lasts about a week in a vase, and it makes a lovely filler around zinnias, roses, asters, and other late-season blooms. The one concern might be the scent: if you can detect it outside and don’t care for it, then it probably wouldn’t be a smart idea to bring it inside. According to An American Cutting Garden, though, the scent isn’t noticeable until a couple of days after cutting, so you may want to experiment with it if you enjoy homemade bouquets. Considering that it’s used as a florist flower in Japan, it can’t be that objectionable. I would be remiss if I didn’t address one more issue regarding golden lace and other species of Patrinia: their involvement in the lifecycle of daylily rust. This fungal disease has emerged as a serious problem for daylily (Hemerocallis) lovers over the last decade or so, and many are understandably agitated about it. To educate yourself about the details of what daylily rust looks like, the facts about how it spreads, and how patrinias can be involved, I encourage you to read about it from a reputable source, such as the Daylily Rust fact sheet at Cornell University Plant Disease Diagnostic Clinic or the Daylily Rust entry in the American Hemerocallis Society (AHS) Daylily Dictionary. However, as Cornell University’s fact sheet points out: “Although Patrinia is a required as a host to complete the lifecycle of the pathogen, the fungus is capable of producing spores that are aggressive and virulent on daylily alone.” To me, that says that we could destroy every plant of every patrinia currently growing in North America and still have to deal with this disease. Maybe that effort would be better put toward breeding more daylilies with rust resistance as well as pretty colors and flower forms? Well, I’ll leave it up to you to decide for yourself whether you want to grow and enjoy golden lace anyway, or grow it and feel guilty about it, or avoid it altogether. Other than the potential rust problem, pests and diseases don’t seem to be an issue for golden lace. This summer was the first time I saw aphids on the flower stems, but they disappeared in a few days without any intervention, before they caused any damage. Want to give this elegant flower of autumn a try? 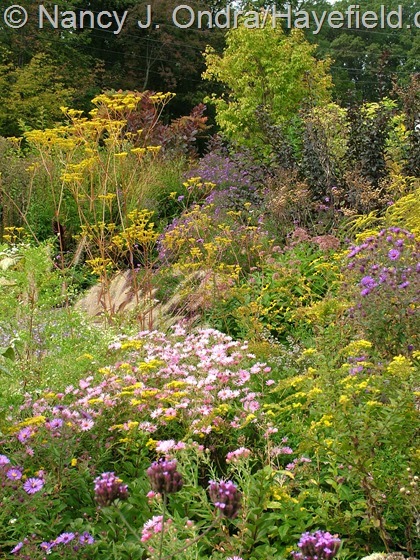 Some plant sources that I found online include Avant Gardens, Digging Dog, and Plant Delights Nursery. The Lazy S’s Farm site lists both the species and the more compact ‘Nagoya’. 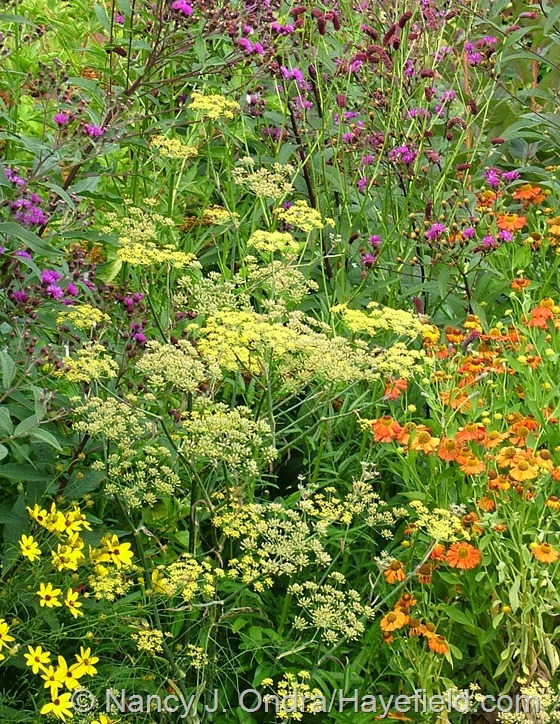 I could find only one commercial source that currently has seeds available: Chiltern Seeds. What a great post! Thanks for this load of ideas for using Patrinia. Welcome, Katrin! It’s such a lovely flower that it’s easy to get excited about it. Thank you for reading! Wow, I’m sold! That’s a beautiful plant. Thanks for the detailed information–it’s always helpful to know what I’m getting into with a new plant. :-) And that bouquet is just gorgeous. Have fun with it, Kristy. It’s kind of like a yellow version of baby’s breath in the arrangement, isn’t it? Your work in the books and in your blog is so good. I am Always looking forward to have more from things you write, Picture and do. I hope I can find some seeds of Patrinia somewhere. PS. Can you tell me please what is the lens you use in your pictures? I am looking a way to make my fotos look sharper. Great to hear from you, Jorgito! I hope you can find some to try in your garden. The lens on my camera is just the one it came with: “Super-EBC Fujinon Lens Optical Zoom.” The camera itself is a Fuji FinePix S7000. It’s so old that it’s been out of production for years, unfortunately. 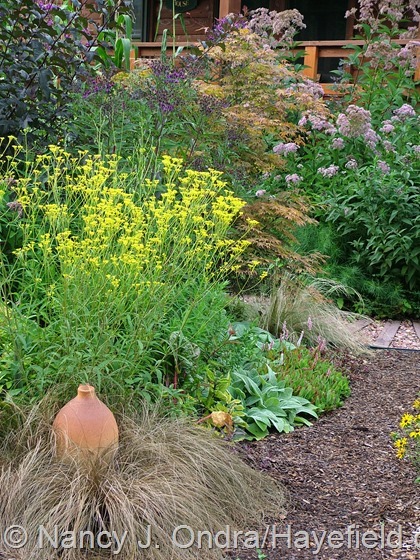 I would love to get hold of this plant, it looks amazing, so does the rest of the garden! Thanks, Becc. I don’t know of any sources in your part of the world, but I wish you luck on your search! Love all the different ways to use this plant. 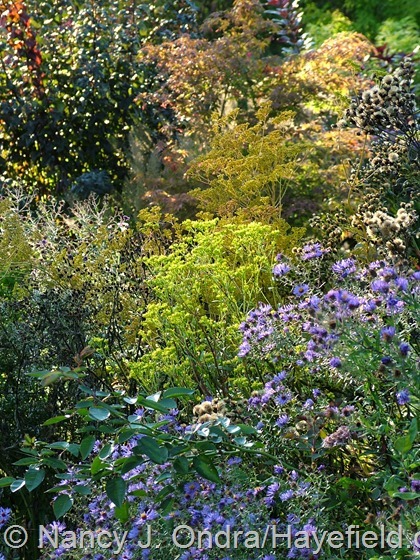 It adds a subtle touch of graceful elegance to the border. What’s not to love about Patrinia? First time I saw it was in Japan, while visiting DH’s family. It was growing wild in fields. When I asked about it, a family member explained that it is sometimes used in painting and traditional fabric designs for yukata. Thank you for such a well-researched post. Hopefully it’ll encourage more people to grow it. How wonderful that you’ve seen it growing in the wild! That must have been a great trip. I hope you got my response to your question about the Amsonia hubrichtii seeds; I definitely plan to collect them for my giveaway and will set some aside for you. re: A. hubrichtii – sounds great! Thank you for thinking of me, Nan. I can imagine, LJ:lots of opportunities to see amazing plants and family to visit too. I hope you get to go back soon. Good morning Nan, thanks so much for the info on the rust. I have daylilies and they get yellow streaks then turn brown, I thought it might be rust but thanks to your info sheets I discovered it is “daylily leaf streak”(Aureobasidium macrostictum), It doesn’t affect the flowering or plant as far as I can see so I’m OK with pulling off the browned leaves, there’s not that many. Love all the gorgeous pics of course! More ideas, you keep me hopping. 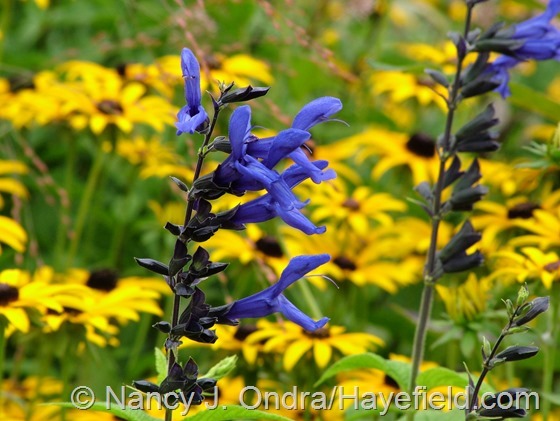 Must research that black and blue salvia, would look great if it gets tall enough for me. That’s good news about your daylilies, Sue. I found out that some of my plants have that leaf streak too. The Salvia guarantica can get 4 to 6 feet here, so the height should work. But it’s not dependably hardy, so I’m pretty sure it would be annual for you. Thanks for all the info on Patrina. I planted it last year and love the airy blooms. This is one of several plants I now grow thanks to you. I’m so glad you’re enjoying it, Barb! May you two have a long and happy life together. Thanks for the wonderful year-long series of photos! Your database must be amazing to keep track of a single plant throughout the seasons! I am just beginning to use Lightroom to keep track of my flowers and other “subjects” but I am still a student of how to organize. Maybe sometime you could comment on what works for you — and obviously you do know what you are doing! Again, thanks so much for the eye candy! Hi Shenandoah! My method for organizing photos is pretty basic, but it works. Here’s an older post I did about it: Putting Words to Pictures. I hope that helps! Thanks so much for your guidance. In Lightroom 5, I can keyword a photo to my heart’s content. Like tagging, I think. I still have to strip the metadata out before I post photos so that nothing private gets inadvertently posted. So it is an extra step. As I said, I’m still learning, but your guidance gave me much to ponder. Again, thanks so much! Yep, that’s the same thing. I put my posts together with Windows Live Writer, which changes my photos from high-resolution to low-res to save space and (as far as I can tell) removes the metadata when it uploads them as a batch, which makes for *much* easier posting. Maybe WordPress makes direct posting easier now, but it was really a hassle doing photo-intensive posts years ago, and I think I would have given up blogging if I hadn’t found Live Writer! Definitely, Ellen, I plan to collect from the golden lace again this year and should have lots to share. I’ll make a special note to make sure you get some. What an information-packed post! 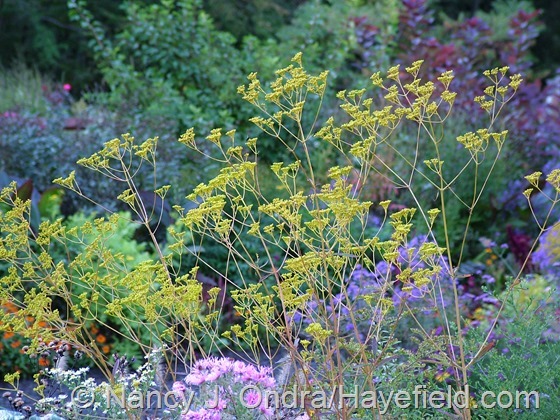 I love yellow and I’ve been impressed by this plant when you’ve shown it in earlier posts. I’m not sure how it would do in my zone 10b garden but the notion of trialing it is tempting if I can get over the daylily rust association. Thanks for the post! Hmmm…I have a feeling it needs a winter chilling period, but the lack of info on it growing in hot climates might just mean that few gardeners have tried it there, so it would be worth the experiment. I received seeds of Patrina from you last winter. They are growing in the garden but will probably flower next year. Can’t wait. Thanks for sending them to me. You’ve most welcome, Cathy. Thank *you* for letting me know that you had good luck with them. Yes, they should flower next year and get better every year after that. Enjoy! Fantastic post, and a fairly unknown plant here in the UK. Would be a perfect filler for this time of year. Now to see if I can find it anywhere for sale. Good luck in your search, Nick. It certainly is a nice source of fresh color for this season. btw the cut flowers photo looks great. At the risk of complicating matters…my understanding is that if golden lace *does* start harboring rust here, the resulting spores can be carried by the wind to affect daylilies well beyond one’s own garden. I figure we’re ok for now, though, since there don’t seem to be any instances of that yet. Well Nan – I think this post qualifies you for a Master’s in Patrinia. It is quintessentially informative to experience a plant in such detail and to see it posing with so many different garden friends, covered in ice, revealing its emerging leaves… a gratifying tour all around, oh yes! Now I’m an M.P.? Or no, that would mean I’m a Member of Parliament, right? So maybe M. Pat.? Of all the new things I learned when researching this, the potential medicinal uses were the most fascinating. That makes it useful as well as beautiful – cool! 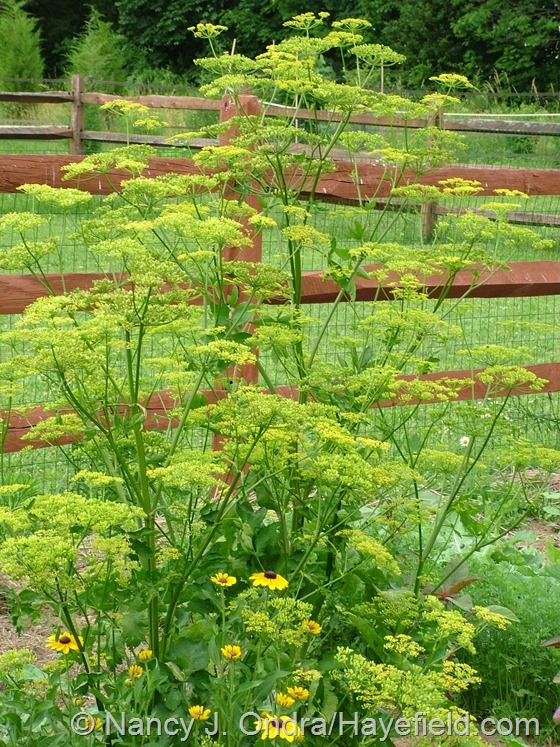 I tried patrinia years ago in my zone 10 garden, and it did bloom, but I can’t remember now if it seemed worthwhile here or how thirsty it was. Clearly, I need to try again. I’d love to try its acid yellow with crimson knotweed. That sounds like a great combination, Denise; I’ll have to try that too. Thanks so much for sharing that it really can grow in Zone 10! I had really good luck with the Patrinia seeds that I got from you last year. I started them outside in a gallon milk jug and transplanted them into 4″ pots. I am just starting to plant them in the garden beds and wherever I can on my 3.5 acres. 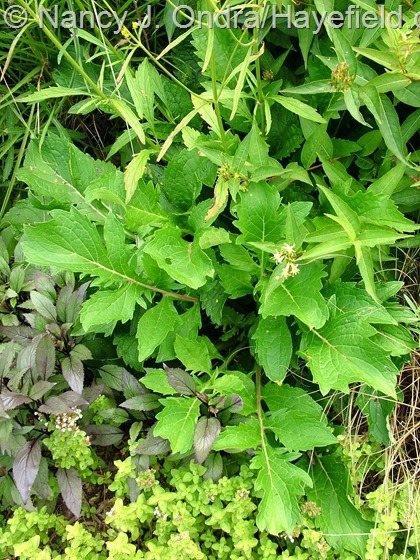 Also had great results from starting the Wild Quinine the same way. Now I am trying to think what seeds I would like to have from you after looking through your posts. The great photos just make you want to have everything! That’s terrific news about both kinds of seeds, Paula! Thanks so much for the update. Do feel free to let me know if you see something new you’d like to try. Thank you for this posting Nan. 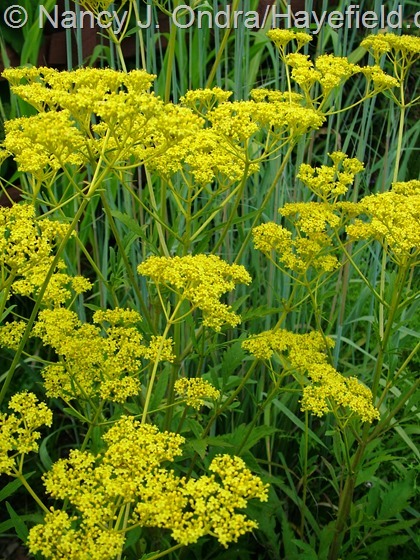 I have just bought a patrinia plant from Beth Chatto Gardens in Essex England and you have given me all the advice plus planting partners I need. I hope my plant looks as good as yours, am hoping to plant it with the verbena and a rudbeckia. You found one – how wonderful! That sounds like a great combination. Best of luck with it, Allan! 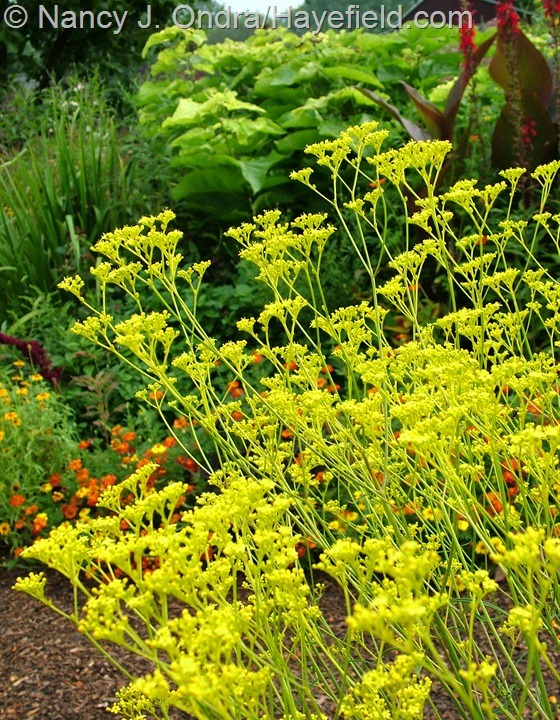 I grew patrinia from seeds that I got from you, Nan! This year they did quite well. However your photos show it as more of a lime yellow, mine are more mustard yellow. 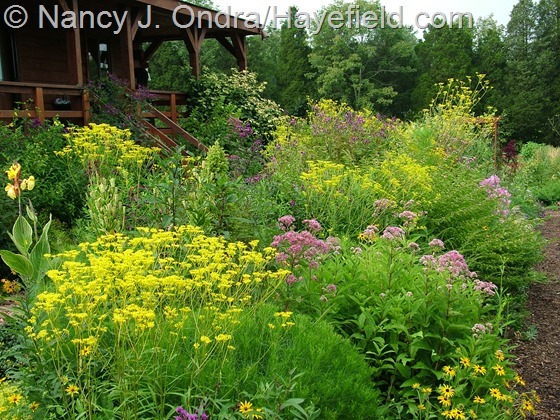 In fact, I find them too similar to goldenrod – same color, same height, same form, same exact bloom time. 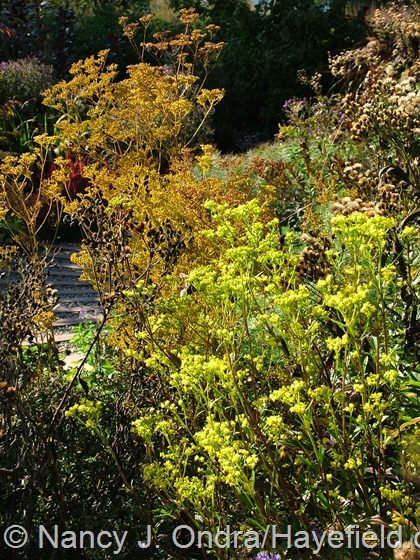 I think anyone who saw them would assume they are goldenrod unless they got really close and were really plant savvy. Only goldenrod spreads aggressively and these don’t. Still I noticed yesterday mine are COVERED in rust. I thought they got it from the asters. SInce I’ve never noticed rust on my daylilies, but the patrinia are covered in it, I’m going to yank the patrinia to stop the infection. So while yours are just beautiful in photos, I’m really not thrilled with them. If I want that height and color and timing, I’ll always have goldenrod. Aw, gee, Brenda – I’m sorry that it didn’t do so well for you. Here, the flowers do get a bit more mustardy yellow after a few weeks, but they’re definitely a clear yellow at first. Maybe I’ll have something else you’d like to try in November!